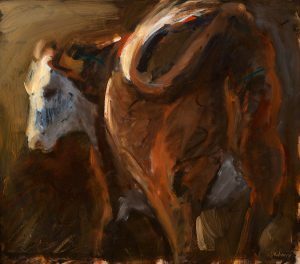 Nadine McHenry was raised on her family’s cattle ranch 30 miles south of Valentine, Nebraska, providing her with inspiration for her paintings. After graduating from high school, she studied art and journalism at the University of Nebraska in Lincoln, receiving a B.A. degree in 1971. McHenry went on to earn an M.S. degree in Education from Kearney State College (now University of Nebraska at Kearney) in 1975, where she also did some teaching. She then taught art in Lincoln Public Schools and Nebraska Wesleyan University in Lincoln, and also served as an adjunct professor in journalism at the University of Nebraska. She worked in advertising and marketing in Lincoln for 18 years, serving as a marketing officer at National Bank of Commerce and as an Assistant Vice-President at Vistar Bank before retiring in 1996. After retirement from business, she turned to painting full time. McHenry has had one-person shows at the Museum of Nebraska Art in Kearney and at the Center for Great Plains Studies in Lincoln. Her work hangs in private and corporate collections, including a series of twelve paintings at Madonna Rehabilitation Hospital, a series of eight paintings at Lincoln’s First Plymouth Congregational Church, as well as a series of four paintings at the University of Nebraska’s College of Law. She is the recipient of the 2002 Lincoln Mayor’s Arts Award for Artistic Achievement and in 2007 was invited by the Willa Cather Foundation to show two paintings at the Sorbonne in Paris. The Museum of Nebraska Art has three works by Nadine McHenry.